I faltered, if faltered's the word. 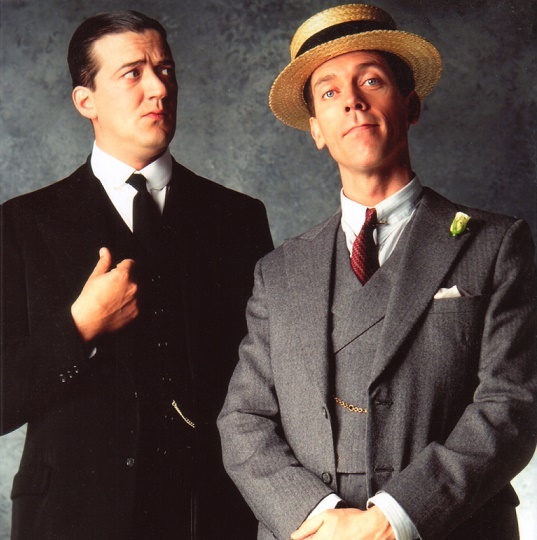 JEEVES: "I regret to inform you, sir, that Miss Bassett has insisted on Mr Fink-Nottle [Gussie] adopting a vegetarian diet. His mood is understandably disgruntled and rebellious." In my darkest hour I had never anticipated anything as bad as this. You wouldn't think it to look at him, because he's small and shrimplike and never puts on weight, but Gussie loves food. Watching him tucking into his rations at the Drones [Club], a tapeworm would raise its hat respectfully, knowing that it was in the presence of a master. Cut him off, therefore, from the roasts and boileds and particularly from cold steak and kidney pie, a dish of which he is inordinately fond, and you turned him into something fit for treasons, strategems and spoils, as the fellow said. 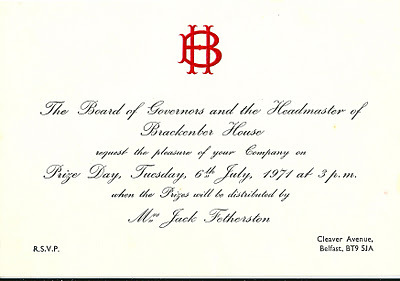 Here's an old invitation to the Brackenber Prize Day in 1971. First published in January, 2012. Alice Jane; Edith Sarah Hamilton; Florence. Mr Rochfort-Boyd inherited from his mother, the Countess of Belvedere, a great portion of the Rochfort estates situated in County Westmeath, and assumed the surname and arms of ROCHFORT by royal licence in 1867. Ethel Victoria; Alice Eleanor; Winifred Florence; Muriel. Major Boyd-Rochfort assumed the surname of ROCHFORT in 1888, on succeeding to the Rochfort estates left by his grandmother, Jane, Countess of Belvedere. GEORGE ARTHUR BOYD-ROCHFORT VC (1880-1940), of Middleton Park, who married, in 1901, Olivia Ellis, daughter of Christopher Ussher, of Eastwell, County Galway. 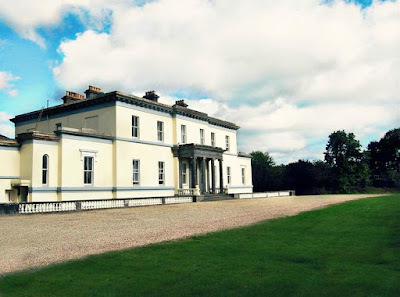 MIDDLETON PARK HOUSE, near Mullingar, County Westmeath, was built by George Boyd-Rochfort in 1850. He commissioned George Papworth, Architect and President of the Royal Academy, to design and oversee the building of the House. Drawings of part of the interior were exhibited by Mr Papworth during the Royal Hibernian Annual Exhibition of 1850. Only the very best craftsmen and materials were used in the building and it is a testimony to those craftsmen and materials that Middleton Park House has stood the test of time since then. It is a fine example of late Georgian architecture favouring the classic Georgian style over the Gothic style evident in other houses of that era. Acclaimed features of the House are its under-floor heating system, stone bifurcated staircase leading to the Gallery Landing and three-storey high atrium lantern located in the Main Hall. Middleton Park House also boasts one of a few Richard Turner Conservatories to be found in Ireland. The House and estate remained in the Boyd-Rochfort family until the early 1960s when it was sold. Since then it has seen many owners, the most colourful of whom was Barney Curly who famously raffled the House in 1986. In quite a state of disrepair when acquired by its current owners, it took a lot of time, effort and care to attention to bring it back to life, bringing in specialist professionals to ensure that the original aesthetic and atmosphere remained. Built between 1840 and 1850, it is unusual in that context, as the Irish famine not only reduced the peasant farmers of Ireland to penury and starvation; it also destroyed the economic basis of the large landed estates held by the old Anglo-Irish aristocracy, as rents could not be paid. It replaced an older house on the site, which was demolished. 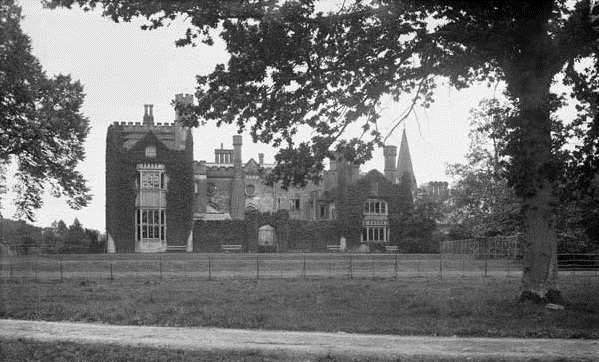 The name Middleton comes from a previous owner of the estate, Mr George Middleton Berry, who subsequently lived in Ballingal House. Middleton Park House was designed by George Papworth to be a technical wonder of its age. It had its own gas-house where coal was converted to gas to fuel the house boilers, and an extraordinary heating system buried in its walls, which circulated heated air. Although built well into the Victorian era, it was created in a classical Georgian style, as opposed to the prevailing Victorian Gothic. It has one of only six turner conservatories left in Ireland. Richard Turner also built Kew Gardens in London and the Botanic Gardens in Dublin. Its entrance hall and sweeping stone, cantilevered bifurcated staircase is regarded as one of the finest of its kind in Ireland, and was famously described as “suitable for Citizen Kane” in Burke's Country Houses. 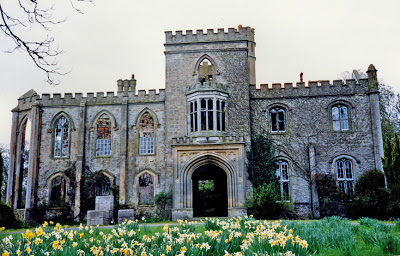 Middleton Park House was built for George Boyd-Rochfort, whose wife was the eldest daughter of the last Earl of Belvedere. The Rochforts owned vast estates in excess of 25,000 acres. GEORGE III stood as godfather to one of them, and they were high-ranking members of the peerage. Mr Boyd was granted permission to change his name to Rochfort-Boyd in 1867 by a petition to the House of Lords. Although the behaviour of George Boyd-Rochfort was questionable during the Irish famine, being cited by the House of Lords for his actions, his successors are remembered today as having been good, progressive landlords. The various land acts and subsequently the Irish land commission reduced the estates to a fraction (470 acres) of what they were. A noted stud was established on the estate and it was the venue for point-to-points, and a starting or finishing point for the Westmeath Hunt. The Westmeath Hunt Ball was also held at Middleton for many years, as well as hare coursing. The estate was a large employer in the area. A great many valuable horses were bred here, including Airborne, Winner of the Derby in 1946. One of the Rochforts (Sir Cecil) also became the royal horse trainer for both KING GEORGE VI and our current sovereign, ELIZABETH II. THE FAMILY sold the House in the late 1950s, when many of the contents were auctioned, including a Persian rug, now said to be worth in the region of $15m. A German family bought the estate, which was sold again in the 1960s to the O’Callaghans who, in turn, sold it to Barney Curley, who famously raffled Middleton Park in 1986. Subsequent owners broke up the estate up into many smaller parcels. The stud farm ceased to operate around this time as well. Many of the original fixtures and fittings in the house were sold or removed at this time. The house, having lost its land, and now existing on only 26 acres, went through a series of owners. It was, at this stage, in need of major restoration as the roof had deteriorated badly with serous water damage evident throughout the house. It also lacked modern wiring, plumbing and heating. The sheer scale of the great mansion, at over 36,000 sq feet, made it impractical as a family home for anybody but the seriously rich. The current owners purchased it in December 2004. They set about converting it into a Country House Hotel and planning permission was obtained for this. The immediate requirement was to repair the roof and make it watertight. Investigations revealed that the roof in the wing and most of the floors were completely beyond repair, as the roof trusses were rotten and some had been cut in a manner that left the roof liable to collapse. The Turner conservatory had lost its original glass and the metal work was seriously corroded. The timber supporting beams in the spectacular entrance hall had also rotted and it was in danger of falling in. These all had to be replaced also. A specialist iron working firm from Germany was brought in to repair the conservatory and some new castings to replace those corroded beyond use were sourced in the UK. Specialist roofers from Austria replaced the wing roof structure. Bangor Blue slates were used. The external render on the house had failed and had to be removed and replaced using, as originally, lime plaster. New Roman cement decorative reveals also had to be cast. The decorative plasterwork inside the house had to be extensively repaired. Extensive fire protection works were undertaken. Three generations of old plumbing and electrics, often surface mounted, were removed and the house completely rewired and re-plumbed. A new waste treatment plant was installed. A specialist engineering firm designed the new heating system which includes underfloor heating in the basement to minimise the visual impact of radiators and some elements of the original system are used to duct hot air into the hall. There are many legends about the house locally most notably that both Napoleon and T E Lawrence (of Arabia) were conceived here (clearly not true in the case of Napoleon, as the house was not built until 1840 and he had died in 1821!). The link that Lawrence of Arabia has to the house is that his father was married to one of Mr Boyd-Rochfort’s daughters - Edith - but who also had five illegitimate sons by Miss Sarah Lawrence his children’s Governess. One of these was T E Lawrence of Arabia. It is not recorded where he was actually conceived, but he was born in Wales. Many of the original drawings of the house were lost in the destruction of the RAI archive in 1916, but an extensive file is held by the Irish National Architectural archive in Merrion Square in Dublin, and some of the estate papers and deeds are held by the National Library of Ireland. Captain Meade was the elder son of John Meade, of Burrenwood, County Down, and grandson of General the Hon Robert Meade, of Burrenwood, second son of the 1st Earl of Clanwilliam. BURRENWOOD, near Castlewellan, County Down, is a 6,170 square foot, horseshoe shaped, rustic villa and cottage ornée, built in the late 18th century. It stands on land, which, in the mid 1700s, belonged to Sir John Hawkins Magill, of Gill Hall, near Dromore. When Sir John died all of his estate passed to his daughter, Theodosia. Theodosia, who married Sir John Meade (later 1st Earl of Clanwilliam) in 1776, was a very able woman, who, unusually for the era, managed all of her estates personally. Theodosia, Countess of Clanwilliam, died in 1817, and left her personal estate to her second son, General the Hon Robert Meade. General Meade is believed to have extended the original house ca 1820, adding the new ornée cottage front section and the wing to the west, as well as increasing the planting around the house. The newly extended "Burrenwood Cottage" is shown on a map of 1834. General Meade lived mainly in London, using Burrenwood as a summer residence. 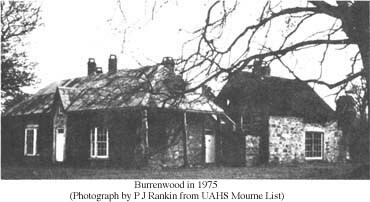 After his death, in 1852, the Meade family largely abandoned Burrenwood and the property left to the care of trusted tenants. It was reoccupied by a Meade descendant in 1934 who, during the 2nd World War, removed the thatch for safety reasons. The house appears to have remained occupied until ca 1980s. The Clanwilliam Papers are held at the Public Record Office of Northern Ireland. SIR THOMAS WEST, Knight, lived in the reign of EDWARD II, and was in high favour with that monarch and his successor. He married Eleanor, daughter and heiress of Sir John de Cantilupe, of Hempston Cantilupe, Devon, by whom he obtained the manor of Snitterfield, in Warwickshire. Sir Thomas was subsequently summoned to parliament as Baron West in 1342, and participated in the wars of EDWARD III. THOMAS, 2nd Baron, who was not summoned to parliament, though served at Crécy in 1346. THOMAS, 4TH BARON, who took a distinguished part in the French wars of HENRY V.
REGINALD, 5TH BARON, who, in the reign of HENRY VI, on the death of Thomas, Lord la Warr, his uncle, had livery of the lands of his mother's inheritance, and was summoned to parliament as 6th Baron De La Warr, on the death of his uncle in 1426. RICHARD, 7th Baron, a staunch supporter of the house of LANCASTER in the war of the Roses. THOMAS (c1457-1525), KG, 8th Baron. WILLIAM WEST, having served in the English army, at the siege of St Quintin, in Picardy, was knighted at Hampton Court in 1568; and created, at the same time, Baron De La Warr (2nd creation). THOMAS, 3rd Baron (1577-1618). This nobleman was governor and captain-general of Virginia. 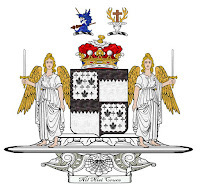 THE STATE of Delaware takes its name from Thomas West, 3rd Baron De La Warr. In the United States, Thomas West, 3rd (or 12th) Baron, is often named in history books simply as Lord Delaware. He served as governor of the Jamestown Colony, and the Delaware Bay was named after him. The state of Delaware, Delaware River and Delaware Indians were so called after the bay, and thus ultimately derive their names from the barony. Many other US counties, townships and the like derive their names directly or indirectly from this connection. JOHN, 7th Baron, KB, a general in the Army, and Governor of Guernsey. His lordship marred twice, firstly to Lady Charlotte, daughter of the Earl of Clancarty. In 1761 this nobleman was created Viscount Cantelupe and EARL DE LA WARR. JOHN, 2nd Earl, was an officer of high rank in the army and appointed, in 1766, Master of the Horse to The Queen. William Herbrand [Sackville], 11th Earl De La Warr, is seated at Buckhurst Park, Withyham, Sussex. Former town residence ~ 14 Bourne Street, London. First published in June, 2012. 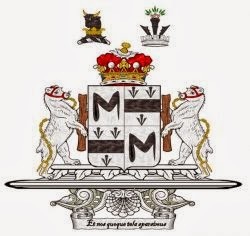 Coat-of-arms courtesy of European Heraldry. Bertie Wooster's arch-adversary, Roderick Spode, Earl of Sidcup, features heavily in this book. 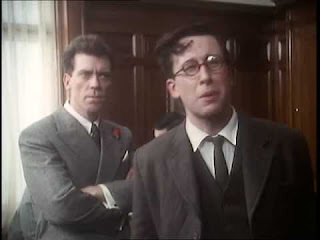 Spode, as Bertie calls him, is a character we all love to hate. '...Spode pivoted round and gave me a penetrating look. He had grown a bit, I noticed, since I had last seen him, being now about nine foot seven. ...I had compared him to a gorilla, and what I had had in mind had been the ordinary run-of-the-mill gorilla, not the large economy size'. ...'To ease the strain, I asked him if he would have a cucumber sandwich, but with an impassioned gesture he indicated that he was not in the market for cucumber sandwiches..."a muffin?" No, not a muffin, either. He seemed to be on a diet. "Wooster", he said, his jaw muscles moving freely, "I can't make up my mind whether to break your neck or not." And so on. Wodehouse's command of the English language was supreme. Brilliant. Wodehouse's character, Spode, is believed to be modelled on the war-time fascist leader, Sir Oswald Mosley Bt. The Mosleys had a connection with Staffordshire, the county where Spode pottery is made; hence the Spode name. This is a branch of the royal house of STUART, springing from Robert, Duke of Albany, third son of ROBERT II of Scotland. ANDREW STEWART, 1st Lord Avondale, was the natural son of JAMES THE FAT (sole surviving son of Murdoch Stewart, 1st Duke of Albany). ANDREW (c1505-49) succeeding his uncle as 2nd Lord Avondale, who exchanged the title for that of OCHILTREE. ANDREW, 3rd Lord Ochiltree (c1560-1629), who, having thus divested himself of that title, was created a peer, in 1619, by the title of Baron Castle Stewart. ANDREW, 3rd Baron (-1650), who married Joyce, daughter and heiress of Sir Arthur Blundell, by whom he had issue, an only child, MARY, who wedded Henry 5th Earl of Suffolk. JOSIAS, 4th Baron (c1637-62), who espoused Anne, daughter of John Madden, of Enfield, Middlesex, by his wife Elizabeth, daughter and co-heiress of Charles Waterhouse, of Manor Waterhouse, County Fermanagh. 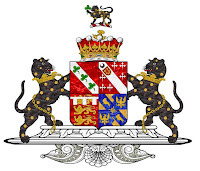 CAPTAIN ROBERT STEWART, de jure 6th Baron, who married Anne, daughter of William Moore, of Garvey, County Tyrone. ANDREW THOMAS, 9th Baron (1725-1809), who was created Viscount Castle Stewart in 1793; and advanced to an earldom, in 1800, as EARL CASTLE STEWART. Andrew Godfrey, in holy orders, father of 6th Earl. EDWARD, 3rd Earl (1807-57), who married, in 1830, Emmeline, only surviving daughter and heir of Benjamin Bathurst, though the marriage was without issue. Mary; Ella Sophia; Alice Maude; Margaretta. Arthur Patrick Avondale Stuart, 8th Earl (b 1928). The heir apparent is the present holder's son, Andrew Richard Charles Stuart, styled Viscount Stuart (b 1953). 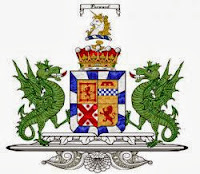 Castle Stewart arms courtesy of European Heraldry. First published in December, 2015. THOMAS BERESFORD, seated himself at Newton Grange, Derbyshire, where he was resident in the reigns of HENRY VI and EDWARD IV; the former of whom he served in his French wars, and according to tradition, mustered a troop of horse at Chesterfield, consisting alone of his sons, and his own and their attendants. MICHAEL BERESFORD, was an officer in the Court of Wards, and was seated at Oxford, and The Squerries, in Kent. SIR TRISTRAM BERESFORD, who was created a baronet, denominated of Coleraine, County Londonderry, in 1665. He married firstly, Anne, eldest daughter of John Rowley, of Castleroe, County Londonderry, by whom he had one son, RANDAL, his heir, and two daughters; and secondly, Sarah Sackville, and had three sons and three daughters, viz. SIR TRISTRAM BERESFORD (1669-1701), 3rd Baronet, who commanded a foot regiment against JAMES II, and was attainted by the parliament of that monarch. SIR MARCUS BERESFORD, 4th Baronet (1694-1763), who espoused, in 1717, Catherine, BARONESS LE POER, daughter and heiress of James, 3rd Earl of Tyrone, and in consequence of that alliance, was advanced to the peerage, in 1720, as Baron Beresford and Viscount Tyrone. His lordship was further advanced advanced to an earldom, in 1746, as EARL OF TYRONE. Anne; Jane; Catherine; Aramintha; Frances Maria; Elizabeth. Isabella Anne; Catherine; Anne; Elizabeth Louisa. His lordship inherited the ancient Barony of de la Poer at the decease of his mother in 1769. He was enrolled amongst the peers of Great Britain, in 1786, as Baron Tyrone; and created MARQUESS OF WATERFORD in 1789. 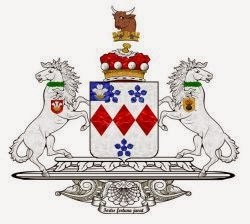 The heir apparent is the present holder's son, Richard John de la Poer Beresford, styled Earl of Tyrone, a polo professional who is known as Richard Le Poer. 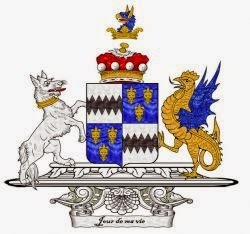 The Waterfords were a Patrick family, four members of whom were Knights of the Most Illustrious Order of St Patrick. CURRAGHMORE, near Portlaw, County Waterford, is the ancestral seat of the 9th and present Marquess of Waterford. Some 2,500 acres of formal gardens, woodland and grazing fields make this one of the largest private demesnes in Ireland and one of the finest places to visit. A Sitka Spruce planted on the estate in the 1830s is among the tallest tree in Ireland and stands guard over King John's Bridge. Built in 1205, this stone-arched structure, spanning the Clodagh River, is the oldest bridge in Ireland. 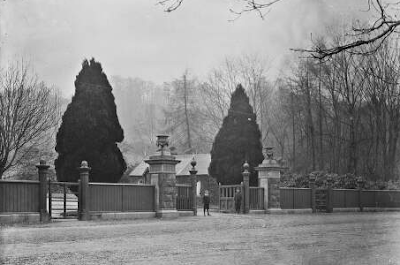 Twelve miles of famine relief boundary wall and four sturdy wrought iron gates surround the estate. Gnarled pink chestnut trees line the approach to the big house and original castle tower. St Hubert's stag with crucifix between its antlers - genuine horns on the de la Poer family emblem - gazes across the large Courtyard from atop the old castle. Today, the formal gardens surrounding Curraghmore House are open for the public to visit on Thursday afternoons from 2pm to 5pm between Easter and mid-October. Group tours of the main reception rooms of Curraghmore House can be arranged by prior appointment. 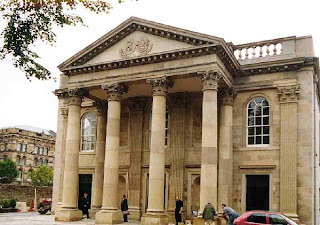 This tour takes in some of the finest Neo-Classical rooms in Ireland which feature the magnificent plaster work of James Wyatt and grisaille panels by Peter de Gree. Curraghmore, near Portlaw, meaning great bog, is the last of four castles built by the de la Poer family after their arrival in Ireland in 1167. The Castle walls are about 12 feet thick and within one, a tight spiral stairway connects the lower ground floor with the roof above. Of the many curious and interesting features of Curraghmore, the most striking is the courtyard front of the house, where the original castle is encased in a spectacular Victorian mansion with flanking Georgian ranges. The combination of architectural features from several periods around the ancient core of the original castle produces a most striking composition; "immediately recognizable and undeniably moving", as it was described by Country Life magazine. In more than 800 years the property has passed through the female line only once, and that was prior to Catherine de la Poer marrying Sir Marcus Beresford Bt in 1715, when she was a mere teenager. 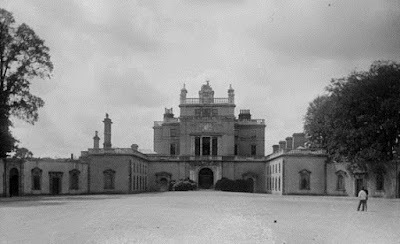 Together with her husband, it was she who carried out much of the remodelling of the house and grounds and it was Catherine, Lady Beresford, who created the unique Shell-house herself. The quality of the craftsmanship employed on the developments on Curraghmore through the ages, has secured the House's reputation as one of the most important country houses in Ireland. In the late 18th century, the 2nd Earl, afterwards 1st Marquess of Waterford, secured the famous architect James Wyatt to design the next phase of modernisation of Curraghmore. Here he created a series of rooms, with decoration considered by many to be among his most successful. 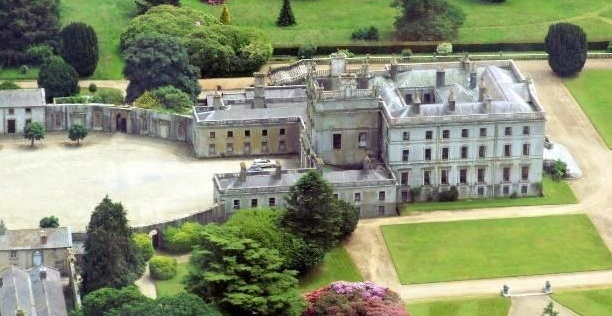 After Wyatt's Georgian developments, work at Curraghmore in the 19th century concentrated on the gardens and the Victorian refacing to the front of the house. Formal parterre, tiered lawns, lake, arboretum and kitchen gardens were all developed during this time and survive to today. At this time some of Ireland's most remarkable surviving trees were planted in the estate's arboretum. Today these trees frame miles of beautiful river walks. Developments in the gardens are still under-way and a Japanese garden has been laid out by the present Lady Waterford. The present day Beresfords are country people by tradition. Farming, hunting, breeding hounds and horses and an active social calendar continues as it did centuries ago. Weekly game-shooting parties are held every season (November through to January); and in spring, calves, foals and lambs can be seen in abundance on Curraghmore's verdant fields. Polo is still played on the estate in summer. Throughout Ireland's turbulent history, this family have never been 'absentee landlords' and they still provide diverse employment for a number of local people. Change comes slowly to Curraghmore - table linen, cutlery and dishes from the early 19th century are still in use. Other former seat ~ Ford Castle, Northumberland. I am grateful to Lord Waterford for the information provided from Curraghmore's website. First published in July, 2011. 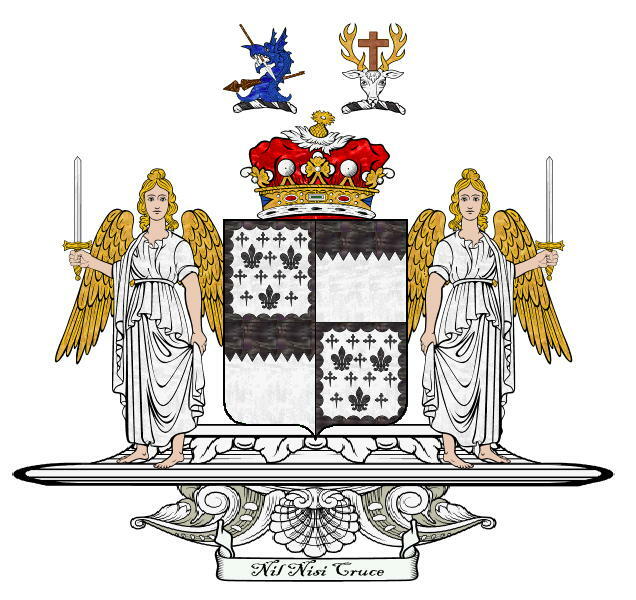 Waterford arms courtesy of European Heraldry. BENJAMIN BLOOMFIELD or BLUMFIELD, of Eyre Court, County Galway, made his will in 1737, which was proved the following year. Charlotte, m Very Rev T B Gough. Sir Benjamin married, in 1797, Harriett, daughter of Thomas Douglas, of Grantham, Lincolnshire. He was raised to the peerage in 1825 as BARON BLOOMFIELD, of Ciamhaltha, County Tipperary. JOHN ARTHUR DOUGLAS (1802-79), 2nd Baron, GCB, PC, DL, who wedded, in 1845, the Hon Georgiana Liddell, daughter of Thomas, 1st Lord Ravensworth. He dsp 1879, when the title expired. CASTLE CALDWELL passed to the Bloomfields through the marriage of Frances Arabella, daughter and co-heiress of Sir John Caldwell, 5th Baronet, of Castle Caldwell, to John Colpoys Bloomfield, in 1817. 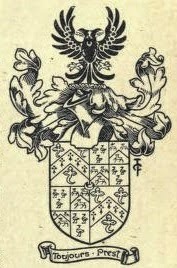 Bloomfield arms courtesy of European Heraldry. First published in January, 2012. CHARLES MOORE JP MP (1804-69), son of Arthur Moore, of Crookedstone, County Antrim, by Mary O'Hara his wife, purchased Mooresfort, County Tipperary. Laura Mary, m G A Vaughan, nephew of 3rd Earl of Lisburne. Mr Moore, Commander of the Order of St Gregory, Chamberlain to Pope LEO XIII, was created a Count by His Holiness in 1879. 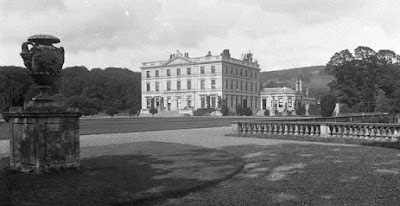 CHARLES JOSEPH HENRY O'HARA MOORE MC JP (1880-1965), of Mooresfort, and of Aherlow Castle, married, in 1917, Lady Dorothie Mary Evelyn Feilding MM, daughter of 9th Earl of Denbigh. He was awarded the Military Cross; Captain, the Irish Guards. 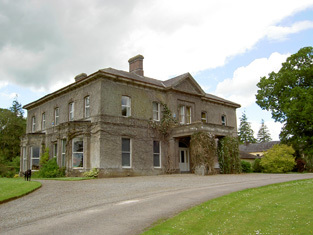 MOORESFORT HOUSE, near Lattin, County Tipperary, was built in 1725 as a three-storey structure. The house was remodelled in the 1850s by Charles Moore MP, converting the house to a two-storey building in order to have higher rooms. The Italianate remodelling of the house included the addition of an ornate portico and pediment to the front elevation and canted-bay windows flanked by classically influenced pilasters giving the building an overall Victorian character. The decorative stained glass window is due to the addition of a chapel designed by George Ashlin also added about this time. The house retains notable interior features including timber shutters and graceful plasterwork to the drawing room depicting musical instruments. The extensive ranges of outbuildings adjoining the house are still used to serve a working farm, and contribute positively to the over all setting of the house. 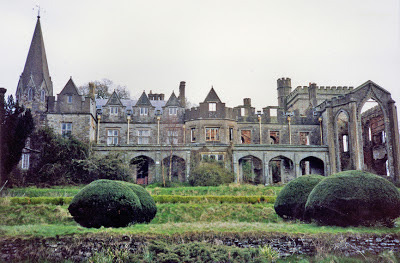 AHERLOW CASTLE, near Bansha, County Tipperary, was also a seat of Arthur Moore MP. This small castle stands in the Glen of Aherlow. It has a polygonal tower with loops at one end; a square tower at the other. Former town residences ~ 64 Prince's Gate, London; 10 Grafton Street, Dublin. TYNAN ABBEY, County Armagh, was built in 1750 and enlarged in the Tudor-Gothic style around 1820-30. 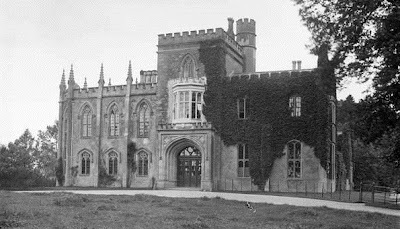 It had an imposing two-storey entrance front, battlemented and pinnacled; a battlemented central tower and doorway too, with pointed Gothic windows. The Rt Hon Sir Norman Stronge, 8th Baronet, MC JP, and his only son, James, were murdered by the IRA in the Abbey, which was burnt to the ground, in 1981. I have written about the Stronge Baronets elsewhere on this blog. Originally the estate extended to some 8,000 acres. ...he showed me an incubating woodcock, hidden in a pool of brown leaves by the edge of the main drive at Tynan and told me that his gamekeeper had seen a woodcock carry one of its young, held between its legs, from an open patch in the woods in to cover; and many times had watched a woodcock feed its young in the same fashion as pigeons. Every year Sir Norman would invite me to Tynan to see the azaleas in colour and the seas of bluebells in the woods and always there was talk of butterflies, painted ladies, peacock and the rest. Sir Norman was the envy of his friends, being an excellent shot. He would often finish a day's shooting with close to 200 pigeons...his cousin, Sir Basil Brooke [1st Viscount Brookeborough], had the edge on him and always seemed to finish the day with more.